The first mention of a Liverpool Fire Department in the history of the community is made in a January 1909 issue of the Medina County Gazette. An article in that paper calls for 25 able-bodied men to form such a group. An organization was formed and a fire near the John Obermiller farm in May of 1909 put that first volunteer fire department to its test. It made a run in that month to put out the fire that had broken out there. 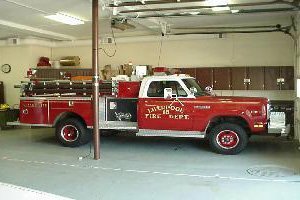 So was born the “Grand-daddy” of the present Liverpool Township Fire Department. The Fire Department as we presently know it, was born in 1934. It was formed in that year when the trustees in office were Ernest Gunkelman, George Wolfe, and Leo Nilges. Funds were solicited for its beginning, with 25 volunteers as members, all governed by the trustees as they are at the present time. Valley City had the honor of being one of the first towns to have a Street Fair and it has always drawn large crowds. The first fair in 1934 supplied some $675, used for miscellaneous equipment. The department began with a 1934 Chevrolet tank truck, 300-gallon capacity and was kept in the William Steinle garage. The old fire station, on the north side of SR. 303 in Valley City, was built in 1935 and was financed by the Fair of that year that brought some $1100 in profits. The site of the present fire station was purchased in 1952, with the front bays and meeting room of the current station being built at that time. At that time there were 3 “fire” phones in some of the local businesses. When the number to these phones was called it rang on all the phones. Once the location of where the fire was established, the siren was sounded. Each day at noon Harry Yost would sound the siren. This is a tradition that is continued to this day. Mutual aid agreements for fire protection were formed and renewed each year with the fire departments of Litchfield, Erhart, Grafton, Grafton Township, Columbia Station, Brunswick Hills and Brunswick City. This has now expanded to include the state mutual aid agreement. The biggest change in the operation of the department took place in 1977 when the department began transporting patients with medical problems to the hospital. This greatly increased the number of emergency calls the department received. In order to accommodate this increase, the roster was nearly doubled from 35 members to 60, and membership was changed to include women. Also in 1977, the building was deemed inadequate for housing all department vehicles. So, an addition was made that provided space for six additional vehicles. This addition continues to meet the needs of the department today. Tragedy struck the department and township on New Year’s Eve 1992, when Assistant Chief Arthur Schumacher lost his life in the line of duty during a water rescue attempt. More expansions followed in 1994. A new addition enclosed the area between the original front building and the 1977 six-bay addition. This new space provided officers’ rooms, an improved kitchen, laundry and showers and lounge/training area. 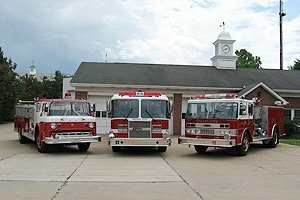 Because there is another Liverpool Township in Ohio, the name was changed to Valley City-Liverpool Township Fire Department. Even with the addition of women to the roster, the department still was shorthanded during the 1990’s. Many of the members went to work during the day. To address this staffing situation, the department added paid daytime staffing coverage in 1998, with two people on duty at the station from 6am to 6pm. A full time position was created in 1999. The nighttime staffing requirements were assigned to three people to be “on call,” from 6pm to 6am the next morning. These members responded from their homes. Our method of dispatching has evolved considerably over the years. Originally, the department was dispatched by members hearing the siren. That meant members had to live or work within hearing distance. In the 1960’s, when the fire department number was called, it rang 20 members’ homes. One person was instructed to answer the phone and others just listened. The phone was answered by Kay Dianiska at Sam & Kay’s Tavern across from the department. In the early 1970’s, the department transitioned to voice-activated table top radios that our own dispatches activated in response to a phone call. The dispatchers were wives of firefighters. The members radios got smaller over the years. Currently, dispatching involves the use of enhanced 9-1-1, a system that brings up the address of the calling party. Dispatching was turned over to the Medina County Sheriff’s Office as the 9-1-1 system evolved. Members now carry hand held radios that are activated when a call is dispatched. Calls are also paged out to pagers and cell phones. The department continues to host the Valley City Street Fair during the last weekend of August, plus an annual pancake breakfast in March. These fund-raising efforts supplement the 2 mil operating levy that was passed in 1981. The department still operates with proceeds from a 2 mil levy today. Today the department responds to more then 500 calls per a year. The majority of calls are medical in nature. The department can provide up to paramedic level service. Medical patients are transported to Medina Hospital, Southwest Brunswick ER, Southwest General Hospital, and Elyria Memorial Hospital. Metro Life Flight is called in for extreme trauma cases. The department is a member of the Medina County Firemen’s Association, the Medina County Fire Chiefs Association and several state and national fire/EMS organizations.